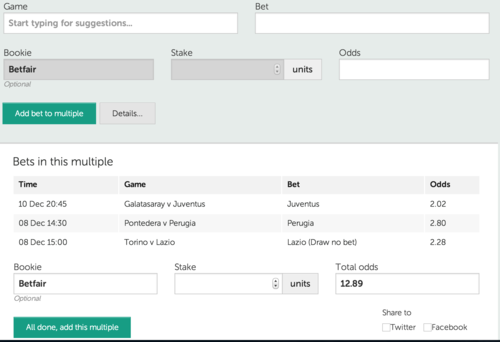 There is a possibility to register multiple bets, also known as parlays. 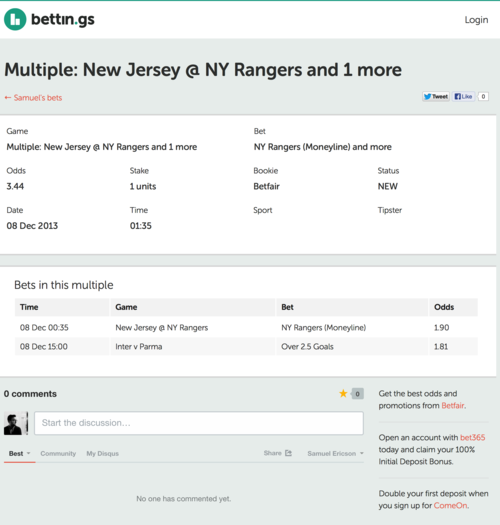 All you need to do is to mark your new bet as a multiple when registering. After that, you can continue to add as many bets as you like to the multiple. All bets you add will be visible in the list below. The odds for the multiple will be automatically calculated, so all you need to enter is the stake for the multiple and, if you want to, the bookie. When you’re done, just push the button to add the multiple. Naturally, the stats will be based on the multiple and not the individual bets, but you can still see and change the information about those as well. That’s just for information though, and doesn’t affect the stats.